Intimidated by risotto? Don’t be! This Mushroom Pea Risotto with White Truffle Oil is a fool-proof and delicious savory meal for your next pasta night. Risotto, arguably the most feared of all pastas. I don’t know how many times I’ve heard that risotto is a hard dish to get right, and for a long time I believed it because I’ve had my fair share of bad risotto. Before attempting to make the dish on my own, I assumed it was beyond my skill scope. It was a dish I enjoyed only when dining out, a dish that I had to order if it was on the menu because cooking it at home was not an option. However, one thing led to another, I married a man from Italy and I found myself standing over a pot and crossing my fingers. b.) the only requirements needed for good risotto are patience and strong shoulder muscles. One thing I’ve learned from immersing myself in Italian culture is that the simplest ingredient combinations can yield the biggest results. I tend to overcomplicate things and try to create bigger and bolder flavors, but there are times you don’t mess with the classics and strictly adhere to the ‘less is more’ mantra. I will try to add garlic to any and everything but for a dish like this, with the strong umami of black truffles, mushrooms and pecorino and the tang of lemon juice, sometimes its best to just leave it alone and let the flavors speak for themselves. Let’s take a moment and talk about truffles. And not the chocolate kind. Italians LOVE their truffles, in fact my husband has family members that are known truffle ‘hunters’ and have dogs trained to sniff out the fungi in the woods of central Italy around his childhood home. Truffles are a member of the mushroom family and have a strong, distinctive earthy flavor that you either love or hate. There are no ‘take them or leave them’ opinions when it comes to truffles, and their rarity is what makes them so elusive (and expensive). There are two types of truffles on the market, black (more common, harvested throughout fall and early winter) and white (very rare, very expensive, and only available in late October through early December). Or you can skip the seasons and cheat by buying an infused truffle oil, as I did for this risotto. The secret to the perfect risotto. The characteristics of bad risotto: soft, mushy, flavorless. The characteristics of good risotto: sticky, cooked ‘al dente’ with a slightly firm texture, packed with flavor. To get the perfect risotto you must first understand the risotto cooking process. Risotto rice is a starchy, pasta-like rice that retains its firmness if cooked slowly; it’s important to choose the right rice, with carnaroli being the gold standard. The rice is stirred into a pot with other cooked ingredients and a small amount of liquid is added in 1/2 cup intervals and allowed to slowly soak into the rice. The key is to continually stir and add small amounts of liquid as the rice dries, keeping it moist (hate that word) but not wet. As the rice cooks, it become larger and stickier, and at about the 20 minute mark (give or take a few minutes) you will have a perfectly cooked risotto. So prepare your shoulder for 20 minutes of stirring; your arm will be sore the next day but it will be worth it. The only requirements needed for good risotto are patience and strong should muscles. If you’re in the market for truffle oil try D’Allessandro or this pack of both black and white truffle oils by Truffle Hunter. Truffle oils can be pricey, but they will last for many dishes because a little goes a long way. Risotto doesn’t have to be hard! 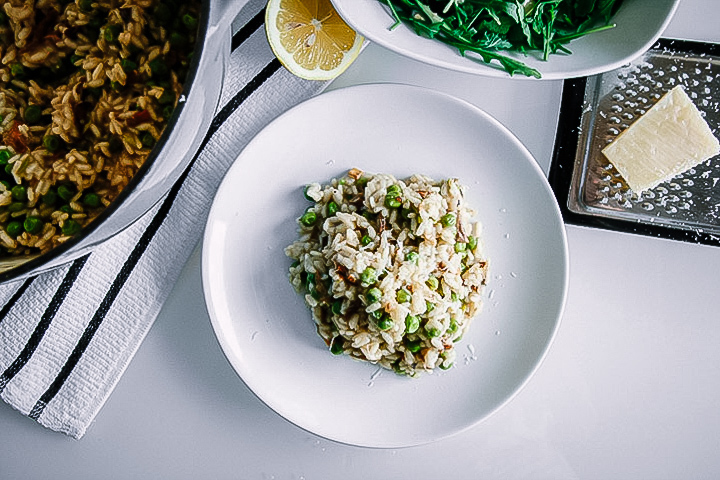 This mushroom and peas risotto with white truffle oil is as easy and stir, stir, stir. 1. Bring about 10-12 cups of broth to medium heat in a medium saucepan, with a 1/2 cup measuring cup at the ready. 2. In the meantime, heat olive oil in large pot or dutch oven to medium heat and add mushrooms and peas. Cook 2-4 minutes, or until mushrooms begin to soften and release liquid. 3. Add risotto to pot and stir to coat with vegetables, cooking about 1 minute until rice begins to dry. Then add truffle oil to pot and allow rice to soak up the truffle flavor, about 1 minute. 4. When rice begins to dry, slowly stir in 1/2-3/4 cup warm broth to rice. Continue stirring rice until well coated. The key is to soak but not over-wet rice, allowing rice to slowly absorb liquid. 5. When rice begins to dry again, add more liquid and slowly stir. Keep stirring in small amounts of liquid and stirring rice for about 15-17 minutes. 6. When rice is larger and beginning to get stickier, taste to ensure it is nearly al dente. The finished risotto should NOT be mushy, but have a firmness and slight crunch mouthfeel. When the rice is almost at desired doneness, add pinch of salt, crack of pepper and juice of one lemon. Then stir in pecorino to lightly coat in cheese. Take rice off heat, and serve immediately with a side of lemon and a small amount of grated cheese on top. Leftovers, Storage, & Reheating: Mushroom Pea Risotto with White Truffle Oil can be refrigerated and stored for up to five days. When reheating add a bit of stock or water to ensure the pasta does not get dry. 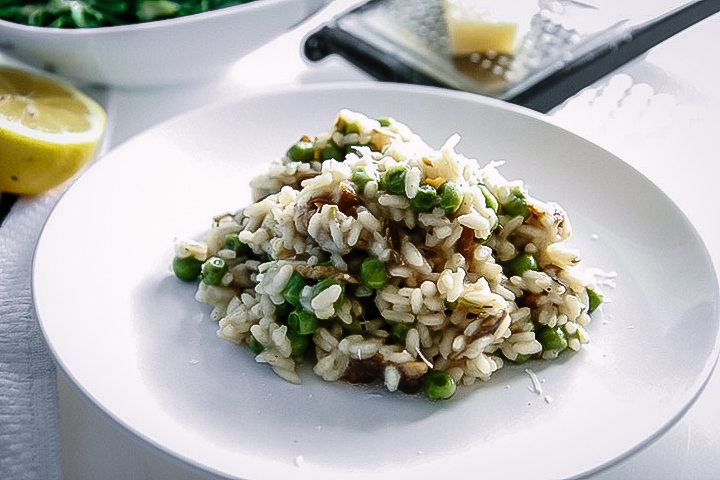 Like this Mushroom Pea Risotto with White Truffle Oil recipe? 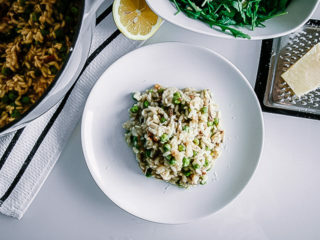 If you like this Mushroom Pea Risotto with White Truffle Oil recipe, try out one of my other pasta my Vegan Fusilli Pasta, Favorite Summer Shrimp & Vegetable Pasta, or Francesco’s specialty Pasta con Aglio, Olio é Peperoncino. Did you make this Mushroom Pea Risotto with White Truffle Oil? 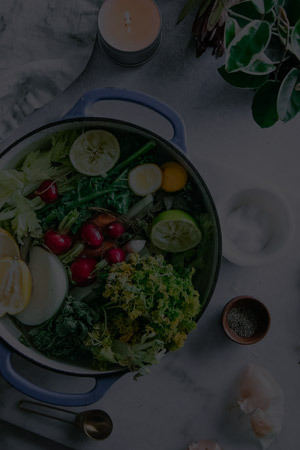 Make sure to post your photos to Instagramor with the hashtag #FITRfood. I can’t wait to see your creations! Mushroom Pea looks so healthy and delicious..wish i had some right now! Well, when you add the white truffle oil and the cheese it definitely take this dish to the more indulgent end of the health spectrum…but hey, you have to indulge every once in a while! This risotto looks delicious! I like the addition of truffle oil!! Truffle oil has become my new favorite addition to pastas and pizzas. Nom! Yes, Vialone nano and Carnaroli are the two best kinds of rice for the “perfect” risotto. Plus, the tips you mentioned 🙂 . Your Pea Risotto with White Truffle Oil looks great, with amazing flavors. I’m glad you agree! My Italian husband approved, and he’s pretty picky about his pasta (and espresso) brands. And yes, it’s definitely flavorful! The truffle oil takes it to the next level. You gave me the courage to try risotto. I have heard the same negativity with this dish but never tried this on my own. Thanks for sharing this! I remember an Italian teacher once telling the class that it was a very difficult technique and most non-Italians never perfect it. I was scared away from trying, but honestly it’s all about patience (and shoulder muscles). Mmmmn, this classic recipe sounds amazing. I love risotto and enjoy making it. There is something calming about all that stirring that I love. I haven’t tried a risotto with truffle oil yet. I love the earthy and sweet flavor combination you have in this recipe. Buonissimo! Mushroom pea risotto sounds like the perfect meal! Add a little truffle oil and OMG! Can’t wait to try this! Truffle oil definitely makes everything better! I’ve been loving it on my pizza and roasted veggies too. So you totally convinced me to finally make risotto. I, too, have been totally scared to try it. But this looks so delish, it’s gotta be worth a shot! The bottomline: stir, stir, stir! I’m not one to patiently (and continuously) cook a meal, but risotto is definitely worth it. Love risotto. This comfort food makes me always hungry. I have never tried white truffle oil. On my to-try list, for sure. thanks for sharing. You won’t regret the truffle oil addition, it’s a must with this recipe! I would love to have a big bowl of this right now! Thanks for sharing this delicious recipe, I think i will be making this real soon! It’s one of my favorites! Like any time you make a recipe, it takes once or twice to get perfect but once you know the foundation for a great risotto then it will be delicious every time. Risotto is the best! I love this spin on it, it sounds amazing! Yes, it’s ones of my favorites! And I can’t get enough of truffle oil, it’s my favorite flavor addition right now. 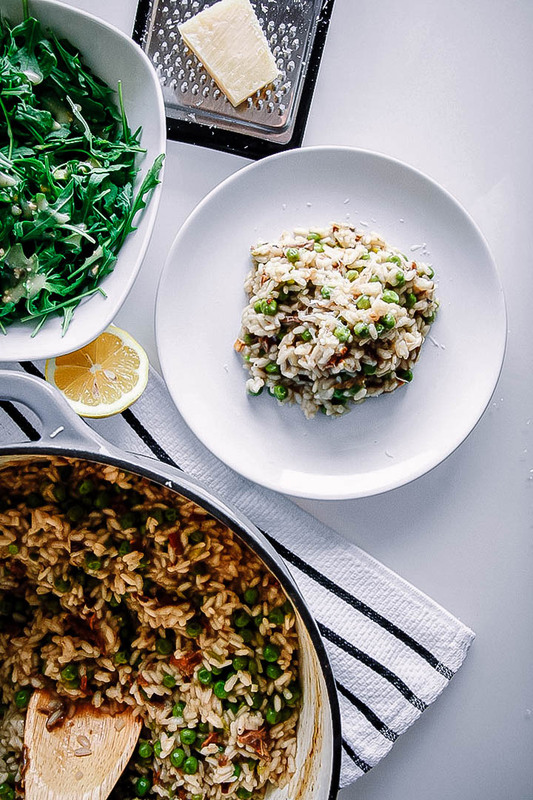 Risotto is so amazing, and you’re right, it really just takes a little patience! When I have the time to spend on a side, there’s really nothing like it – and the peas and truffle oil just put it over the top! Great recipe! I will have rock hard shoulder muscles and when anyone asks me how I got them I’ll say “risotto”. Mushy risotto is the WORST. I’m so glad you’ve called that out, because I’ve definitely had mushy risotto in restaurants before and when I’ve sent it back, they looked at me like I had two heads! I know, I just a good Italian restaurant by its risotto. It must have some sturdiness to it, it shouldn’t be the texture of oatmeal! I love the strong should muscles joke, so true! I am totally the one who was always scared to make a risotto, but i will try soon. You must! Better start toning those shoulders though ;). Yum! I love everything about this recipe, especially the fresh green from the peas. What a great way to punch the flavor up with white truffle oil! The truffle oil is my favorite flavor addition right now! It takes a delicious risotto next level. You had me at peas and mushrooms. I really love this combination. I don’t have risotto rice, but I have another medium grain rice that I would try to substitute to make this. Delicious! Yes, definitely give the other rice a try! The thing with risotto is that it soaks up liquids well and gets sticky, which is the consistency that people love with traditional Italian risottos. And don’t forget the truffle oil! It really makes this dish. Let me know how it goes!